Published by Dell Publishing Co., Inc.
All rights reserved. No part of this book may be reproduced or transmitted in any form or by any means, electronic or mechanical, including photocopying, recording or by any information storage and retrieval system, without the written permission of the Publisher, except where permitted by law. Delta @ TM 755118, Dell Publishing Co., Inc. In the 1940's, Dr. Immanuel Velikovsky developed a unique model for the recent history of the solar system. His ideas were eventually presented in the form of a cosmological reconstruction titled Worlds in Collision. The most familiar aspect of this work dealt with close encounters of some of the planets (i.e., Venus, the Earth, and Mars) in historical times. Velikovsky also challenged the chronology used for certain historical periods (i.e., the period from the fall of the Egyptian Middle Kingdom to the time of Alexander the Great's successor in Egypt, Ptolemy I) which he viewed as being Ages in Chaos. Since these ideas were first presented, considerable evidence has accumulated which supports both the historical reconstruction and the possibility that the proposed physical interactions did occur. 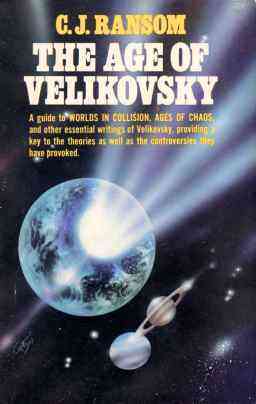 Many discoveries of the Space Age were anticipated by Velikovsky's theory. But more important, whether or not these discoveries were anticipated, these and other space probe data fit exceedingly well with the model he proposed. Also important is the fact that many of these discoveries were not anticipated by conventional thinking of the late forties and early fifties. In fact, in some cases, the opposite of what was expected was found. In addition to not having been expected, some of these data require strained ad hoc hypotheses for explanations under accepted theory. In light of the historical and physical evidence, it seems that it would be in the best interest of the scholarly community to consider Velikovsky's suggestions as a reasonable alternative to the opinions presently taught about the history of the Earth. Unfortunately, many scholars have not investigated Velikovsky's theory properly because they have been told the ideas are unreasonable. Obviously, everyone cannot take the time to study in detail every new idea that is postulated, so even scientists often must rely on the word of others. At first it was relatively easy for some scientists to persuade other scientists not to take Velikovsky's work seriously because his ideas were not the opinions that had been held sacred by the scientific community. Distorted sensationalized reviews and misrepresentations about what Velikovsky said made it even easier to convince some scientists that they need not investigate the theory. As more was learned about our solar system, a number of scientists began to realize that Velikovsky's theory conflicted only with accepted opinions and did not actually conflict with known facts. Some scientists, who originally committed themselves to irrational attacks on Velikovsky and his work, then felt constrained to defend their actions. One of their methods was to try to convince the public, and as many other scientists as possible, that no qualified scientist or historian would ever investigate anything Velikovsky said. This is completely unfounded, as will be demonstrated throughout this book. Another method was to repeat previously accepted dogma, as if it were unalterable fact, and have defenders of this dogma publish supposedly scientific treatises which were irrational or irrelevant, and sometimes unethical. This book contains replies to the most common misrepresentations. In addition, this book was written to provide a complete overview of the theory and to demonstrate that this well thought out theory has considerable support from many fields. For a more complete understanding of Velikovsky's ideas, the reader should refer to Velikovsky's books and the continuing analysis of his ideas which is available in the journal KRONOS, from Glassboro State College, GIassboro, New Jersey. Although Velikovsky has encouraged me during the preparation of this work, he did not see the manuscript before publication. All of the mistakes are mine, and his work should not be judged harshly on the basis of any errors that are my own. Immanuel Velikovsky was born in Vitebsk, Russia, on June 10, 1895. He learned several languages as a child, and graduated with full honors from Medvednikov Gymnasium in Moscow. He then studied at Montpellier, France, traveled in Palestine and in 1914 began pre-medical studies at Edinburgh, Scotland. His studies were interrupted by World War 1, and he returned to Moscow. There he studied law and ancient history at the Free University. He continued his work toward a medical degree and in 1921 received his medical degree from the University of Moscow. Dr. Velikovsky then traveled to Berlin where he and Professor Heinrich Loewe founded and published Scripta Universitatis, conceived as a cornerstone for what would become Hebrew University at Jerusalem. The journal contained contributions from outstanding Jewish scholars in many countries. The articles were published in the authors' native languages and in Hebrew. Albert Einstein edited the mathematical-physical volume of Scripta Universitatis. In 1923, Dr. Velikovsky married Elisheva Kramer, an accomplished violinist from Hamburg. That year they moved to Palestine, and he began medical practice. He was a general practitioner and after studying in Vienna under a student of Freud's, Dr. Velikovsky began practicing psychoanalysis. In 1930, Velikovsky was the first to suggest hat pathological encephalograms would be found characteristic of epilepsy. Distorted and accentuated brain waves were later found to be important clinical diagnostic symptoms of this problem. Velikovsky edited Scripta Academica Universitatis and published some articles in Freud's Imago. In the summer of 1939, Dr. Velikovsky came to the United States to complete research for a book. The intended book was to be about Freud's dreams and three characters of interest to Freud: Moses, Oedipus and Akhnaton. The book was nearly completed when other research led to discoveries that would change the course of his life. I would like to thank the following people for their interest and providing helpful discussions, correspondence and references. Dr. John Lynde Anderson, Dr. Donald Anthony, Dr. Jerry Arnet, Dr. Ram Babu, Dr. Elizabeth Chesley Baity, Dr. Robert W. Bass, Prof. John M. Bell, Dr. Donna Boutelle, Dr. George Brigman, Dr. Geoffrey L. Broderick, Dr. Mary Buckalew, J. B. Bulloch, Dr. Albert W. Burgstabler, Dr. Leonard P. Caccamo, Dwardu Cardona, Dr. David C. Carlyle, Dr. Harris Carter, Prof. Richard W. Chadwick, Dr. Melvin Cook, Dr. A. Lucile Cox, Duncan B. Cox. Dr. B. C. Deaton, Vine Deloria, Jr., Prof. Martin Dickson, Prof. Patrick Doran, Robert B. Driscoll, Dr. H. C. Dudley, Dr. James A. Durham, Dr. H. R. Dvorak, Dr. Stephen Epstein, Dr. Felix Fernando, Dr. Jorgen Fex, Dr. Reuben Fields, Leo Fox, Dr. Richard Freeman, Prof. Alexander H. Friedman, Dr. Dan Gibson, Dr. James Gilcrest, Prof. Cyrus Gordon, Dr. Alan Gowans, Dr. Alfred de Grazia, Prof. Lewis M. Greenberg, Dr. David Griffard, Dr. George Grinnell. Dr. Richard F. Haines, Dr. Joyce Harden, D. C. Helton, Dr. G. C. Henderson, Dr. T. Walter Herbert, Dr. Robert H. Hewsen, Dr. Hilton Hinderliter, L. H. Hoffee, Dr. W. G. Holmes, Dr. David Huebner, Edward Imparato, Frederic B. Jueneman, Ralph Juergens, Dr. Michael Kamfin, Prof. Emeritus Norman M. Kastler, Dr. J. C. Keister, Dr. Dorothea Kenny, Dr. K. G. Kibler, Dr. J. B. Kloosterman, Dr. Leroy Lewis, Marvin A. Luckerman. Dr. Euan MacKie, Dr. A. J. Mantura, Dr. Joseph May, Dr. Pat McDade, Dr. Daniel McLallen, Dr. Earl Milton, Dr. William Mullen, Baxter Mullins, Dr. Robert Oliphant, Dr. G. W. van Oosterhout, Dr. James Outenreath, Prof. A. M. Paterson, Roy Patience, Dr. Robert C. Pollock, Dr. J. C. Redman, Dr. John Regalbuto, Dr. Williarn Regelson, Dr. Ellis Rivkin, Dr. Zvi Rix, Dr. Robert Rock, Dr. John Romanko, Prof. Lynn E. Rose, Prof. Emeritus Alexandre Rothen, Dr. Lionel Rubinov. Dr. Ron Sanders, Prof. Claude Schaeffer, Prof. Albert Schatz, Dr. Hans Schluter, Eddie Schorr, Dr. Charles Scott, Prof. A. J. Sharp, C. S. Sherrerd, Dr. Steve Sims, Prof. Warner B. Sizemore, Dr. C. Ray Skipping, D. 0. Smith, J.D., Dr. Joseph A. Soldati, Dr. Jon Sollid, Dr. H. C. Sorensen, Dr. George W. Spangler, Dr. Leonard Spialter, R. Standfield, Dr. Livio Stecchini, Dr. Harold Stern, Prof. David Stove, Prof. Carter Sutherland, Dr. Jerry Swint. Prof. J. Terasmae, Dr. Charles B. Thaxton, Dr. C. W. Tow, Prof. Lynn Trainor, Robert Treash, Harold Tresman, Raymond Vaughan, Dr. Immanuel Velikovsky, Prof. S. K. Vseksvyatskii, Dr. Robert L. Wadlinger, Dr. Irving Wolfe, Dr. James Wilson, Dr. B. G. W. Yee, Henry Zemel. I would also like to thank the following organizations for their efforts in behalf of this work: The General Dynamics Management Association, Universal Map and Drafting Co., Electronic Monitors, Inc., The Fort Worth Museum of Science and History, The Fort Worth Astronomical Society, Cosmos and Chronos, Inc., all of Fort Worth, and KRONOS of Glassboro, New Jersey, and Innovative Concepts Associates of San Jose, California. In addition, I would like to thank the following for their help with typing the manuscript: Betsy Caraway, Wanda Marstrand, Susan Weber and my wife, Linda. Linda also provided a number of references relating to Native American and Mesoamerican cultures. Pertinent references were also made available by Helen Davis and Mildred Onken. Also I would like to thank the following for their many helpful suggestions with regard to the presentation of the material: Dr. James A. Durham, Darrell H. Hanson, Ralph Juergens, Dr. Dan McLallen, Dan Ray Moore, and Dr. and Mrs. C. W. Tow. My sincere gratitude is extended to Professor Lewis M.Greenberg, Ralph Juergens and Professor Lynn E. Rose for reviewing the material and making valuable editorial suggestions. I would also like to thank Professor Lynn E. Rose for the title and Jay M. Wilson and my daughter, Michelle Ransom, for assistance in designing the cover. Finally I would like to extend special thanks to Dr. Immanuel Velikovsky for his encouragement during the preparation of this book.